When you think Rottweiler temperament, think "Grizzly bear on the outside - Teddy Bear on the inside". They can have a very intimidating look, and will protect family and property with their life if necessary. A Rottweiler has a calm stare, which is really effective at telling people to "back-off." They even kind of look like a bear, especially from the backside. Then there's the "Teddy bear on the inside." The real Rottie temperament exhibits a very loving side to his family. They just want to be with their people, whether that's working or sleeping. Most Rottie's don't mind big bear hugs, and they love to snuggle up and fall asleep with you. Pictures can really tell a story, so I used a lot of them on this page – And just take a look at the video further below! 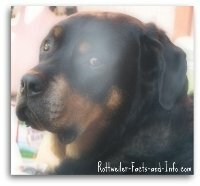 The Rottweiler is so misjudged because of irresponsible owners who either train their dog to be mean, or don’t train them at all. A bad image is then perpetuated by people who are just scared of them because of their size and appearance. 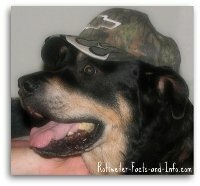 Rottweiler’s naturally love people, and are so smart that it’s very easy to bring out their real temperament. This is one of the reasons that the bad reputation they have, makes me so mad. 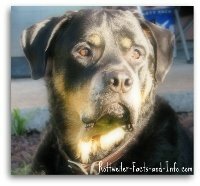 You can usually find a Rottie quietly observing, and analyzing different situations he encounters, then acting accordingly. Kind of like a chameleon, he’ll change his temperament depending on what the situation calls for. For instance, when my husband and I are just relaxing in the living room, my dog is basically just chill’n with us. He can usually be caught either relaxing on the floor, or on his couch. When we’re out in the yard working, or his daddy’s clearly getting ready to go to a swap-meet, Chevy can be found guarding us and the merchandise. 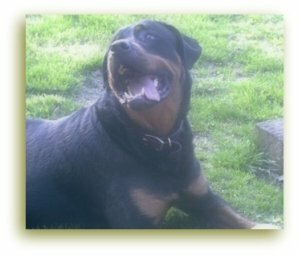 After all, typical Rottweiler traits and Rottweiler temperament go hand in hand, and guarding is one of their strongest traits. It kind of looks like he’s laughing in the picture on the left, but he was actually really hot in the sun. I had to bring water to him, because he refused to leave his post. The picture on the right is of him guarding our trailer full of beer in a Wal-Mart parking lot. We were driving from North Dakota to Washington, and had to stop for a new set of tires. Lots of people walked past him and smiled. He just calmly watched them. I’m quite sure if someone had tried to get too close to the trailer, they would have met his alter ego. There are of course times that call for serious grumpiness – like when you’ve been riding in a truck for 1300 miles and you’re just ready to be home. For the most part, both of my Rottweiler’s temperaments have been calm, sweet and silly, but they are both grumpy when you wake them up from a good nap! Make sure you head your dogs warning signals, and deal with any aggressive tendencies immediately. 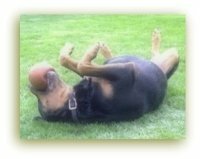 If I had to choose one word to describe my male Rottweilers temperament, I would have to say "class-clown." Ok, that’s actually 2 words, but that’s what he is. He is basically a 2 year old goof-ball in a 9 year old's body, and he loves to make people laugh. He can usually be found with a ball in his mouth, and there’s no better time to play like the present. I hear story after story about how funny other Rottweilers are. They are notorious for making their families laugh. 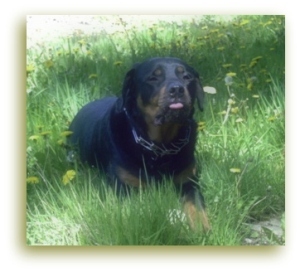 A well raised, properly trained and socialized Rottweiler temperament will be calm, self-confident and loving. She’ll love to be wherever you are, and even snuggle and give kisses . . . .when that’s what the situation calls for. She’ll also guard and protect anything that belongs to her (family, property, cars, other household pets) when the situation warrants. 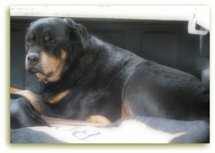 I’ve found that my male Rottweiler is the most protective, and on guard duty when he’s on or in his property (his yard, or his truck). I take him to the nearby drag racing track quite often in the summer, and he is extremely friendly when we’re in public. He’s a great ambassador when we’re out and about, but not so much at home. My female Rottweiler was actually quite opposite. We raised her from a 9-week old puppy, and socialized a lot. She wasn’t unfriendly in public, and would always sit and allow people t pet her. She just wasn’t quite as exuberant about meeting new people as my boy is. Because we raised her from such a young age, she was really good at reading my vibes when someone would come to the house. She could just tell the difference if I was talking to a stranger rather than a friend, or especially if I was a little un-easy about the person. She would read me, and act either friendly or reserved accordingly. To a certain extent the Rottweiler temperament is inherited, but it’s not absolute. In the end, proper training and socialization are more important. Of course that’s only my opinion, but I do speak from experience. Having said that. . . . . 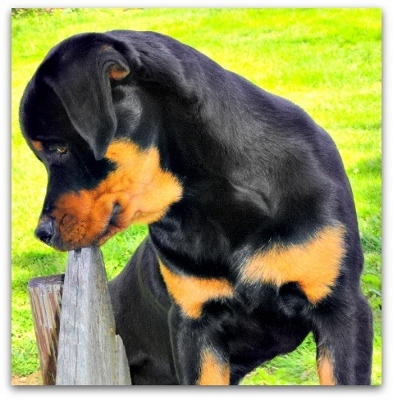 If you’re going to purchase a Rottweiler, then you need to be diligent about finding a reputable Rottweiler breeder that’s intimately familiar with the Rottweiler temperament, and has access to both parents, so that you can observe their temperament. Of course, that won’t be possible if you’re looking to rescue a Rottweiler. That's why it’s also important to remember that inherited Rottweiler temperament isn’t absolute. Take our Rottweiler rescue for instance. . . . .
We have no idea who his parents were, or what really happened to him in the first 15 months of his life. Although we do know that he was abused, neglected and abandoned. However, his saving grace when he came to us, was that his overall temperament was sweet and goofy. He just wanted to love and be loved – even though he acted like an unruly teenager. If you’re thinking about getting a Rottweiler as an adolescent or adult, just keep in mind that every dog is different. You’ll have to observe them in different situations to really know what their temperament is like. Also keep in mind that untrained and / or abused is different than not having a good temperament. Bottom line is that the real Rottweiler is awesome, but they absolutely are NOT for everyone.